Money in the Garage: ...And we’re back! One of the biggest challenges in our move was dealing with the stuff I’d accumulated over the years. Plain and simple, I am a pack rat. Not the crazy, extreme hoarder type that you see on TV, but I do hang onto stuff either for sentimental reasons, or because I think could make some money reselling it in the future. However, faced with downsizing to a smaller home with less storage space, I had to make some tough decisions. 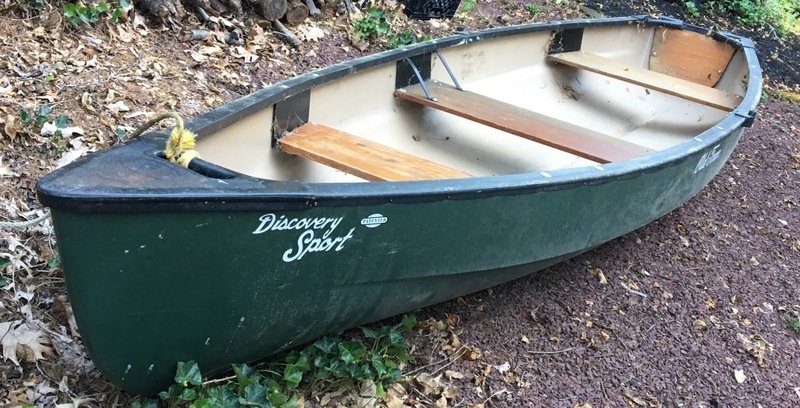 For example, you may remember my long-ago blog piece on how I trash picked an Old Town Canoe. Some years ago, Mrs. Dude spotted the canoe sitting out for the trash down the street from our old house. After reporting this unbelievable find to me, we immediately jumped into her mini-van and raced down the street to grab it. I quickly hustled the canoe into the back of Mrs. Dude's mini-van. Not wanting to waste time strapping the canoe down, I literally crouched down in the back of the van and held onto the stern as we drove away. The canoe had a few dings and missing pieces, but I ordered some replacement parts and made the necessary repairs to it. It was a neat project, and within a few months, we had it back out on the water. Over the years, my kids and I enjoyed many fun times taking it out on the local streams and lakes. But unfortunately, that was then and this is now. Once we sold the house it was time to make a tough decision. Do we take the big canoe with us or sell it? After some internal debate with myself, I decided the canoe wasn’t coming with us. For one thing, we hadn’t used it in years. Secondly, it wasn’t worth the hassle of moving and storing it until my grandson would be the right age to take it out. Besides, I could always buy another one when the time was right. So with that, I sold my trash picked Old Town canoe on Craigslist for $300 dollars. I addition to the canoe, I also sold the oars and life preservers for another $50 bucks. Taken together, that entire canoe package netted me $350 dollars! That left me with less stuff to move and some extra cash in my pocket for home improvements to the new house. Another heavy item I had to decide on taking, was our ornamental garden fountain which sat off patio for many years. Mrs. Dude bought the fountain for me as a birthday gift twenty years ago. I really liked this fountain. Sitting on the back patio with the sound of the water falling into the basin was always relaxing. It also happened to look great. However, when it came time to move, I decided the fountain wasn’t taking the trip with us. For one thing, we rarely sat out back on the patio anymore. Secondly, the fountain was showing it's age. The spigot produced only a small dribble of water flow due to a partial clog in the pipe. Combine this with the fact that the fountain was as heavy as a small boulder, and I saw no reason to drag it to our new house. 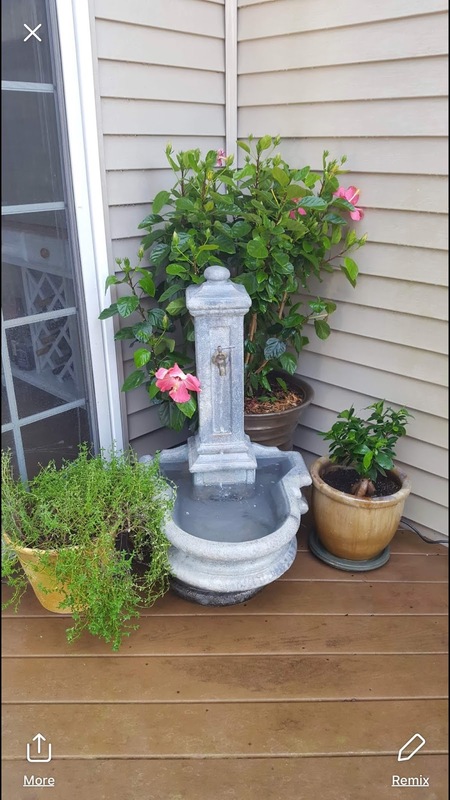 I posted the fountain for sale on my local Facebook yard sale group asking $25 dollars. I would have asked for more, but I felt the clogged spigot hurt it'’s value. Despite that, a women quickly scooped it up. She was an obvious fixer-upper person, because she promptly powerwashed the fountain and somehow unclogged the spigot. The buyer was so proud of here restoration that she sent me a photo of the revitalized fountain. I have to admit, I felt a tinge of regret. My twenty year old fountain looked good as new! As good as that transformation was however, another buyer really stepped it up. 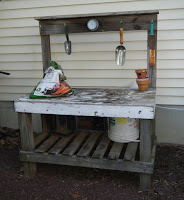 For many years, we kept a garden potting table on the side of our house. It served as a work table for various garden and household projects. Just as I did with the canoe, I had rescued the table from the trash after finding it curbside. Judging from it’s original appearance at the time, it looked like it had been used as a tile cutting table. 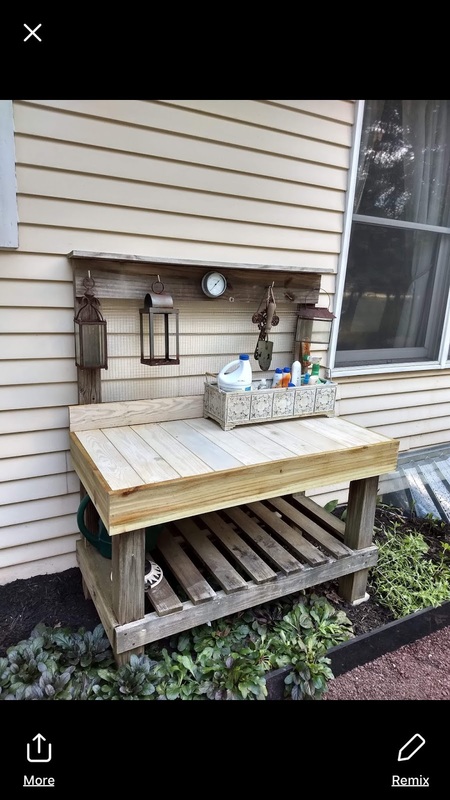 Seeing it’s potential as a handy gardener's table, I hauled it home, adding a storage shelf underneath and a backboard with hooks and a barometer. I also rebuilt the table top, adding a new piece of plywood which I then painted green. It was one of the more practical salvage pieces I ever recycled and we enjoyed many years of use out of it. Over time however, the table top began to rot and just generally fall apart. I attempted a quick fix up, replacing the top board, but never getting around to a new coat of paint. The whole thing was looking ratty, so when the time came to sell the house, I decided the table was not coming with us. Once again, I used our local FB yard sale group, selling the table for forty bucks. It was purchases by a women who’s husband was a carpenter. When she got the table home, they went to town on it-ripping out my rotting plywood top and replacing it with spiffy looking wood planks. The result was a beautiful "Pottery Barn” quality gardener's table. After the restoration, the buyer e-mailed me a photo of their finished project. Once again, I felt a little regret and thought maybe I should have done the same thing. But in the middle of a move, who has time for that? So I made my peace with it and moved on. As the saying goes, “You can’t take it with you.” The table went to a good home and I made a few bucks. There’s still more stuff I sold in those last months prior to moving. We’ll save those tales for another blog. I will say this for now. Of the many things I learned in this downsizing/moving process, the most important thing is this... GET STARTED EARLY! If you plan to downsize as we did, get into your closet, attic and basement right now and start selling the stuff! Our downsizing journey began over two years ago. Once the decision was made, we started the process with a plan to begin by selling the largest, bulkiest items in my house first. Furniture, outdoor items, bikes and other big things were the first to go. Although it was a lot of work, for me the whole process was actually fun. Every time I buyer walked away with something from our house, I thought to myself, “That’s one less thing I have to pay the movers to move!” In addition, all the money we’ve made from the sales will be reinvested in home improvements at our new house. It’s awesome to see the fruits of all those sales turned into tangible home improvement like new floor tile, landscaping, ect. Now that it’s Spring, it’s only appropriate that MoneyintheGarage.Com is back with new garage sale flips and a few more downsizing flips too. This Dude is also back out hitting the yard sales and thrift shops. The process goes on...just from a new location. How’s the flipping business going for you? Any examples of stuff you've sold during a house moving or downsizing experience? If so, add your story in the comment section below.